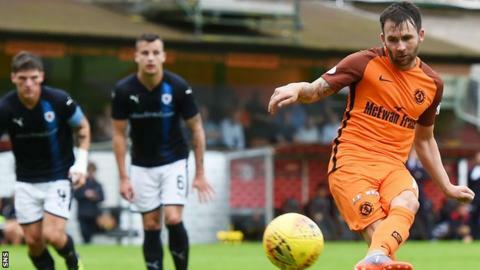 Ray McKinnon played down suggestions that goalkeeper Cammy Bell is on his way from Dundee United to Kilmarnock. The United boss has signed Harry Lewis on loan from Southampton and Deniz Mehmet from Port Vale and negotiations have taken place with Kilmarnock, with Bell keen to return to Rugby Park. "There is no situation," McKinnon told BBC Scotland ahead of a 2-0 League Cup win over Raith Rovers at Tannadice. "Cammy has an injury and we wanted to make sure we had plenty of cover." Paul McMullen and James Keatings scored their first United goals in the Group C tie. McMullan broke the deadlock when he curled a shot high into the corner to beat Raith goalkeeper Aaron Lennox. Keatings' scored from the penalty spot in the second half to make the points safe for the home side. However, it is Cowdenbeath who occupy top spot in the group, on goals scored, after they won 4-2 against Highland League champions Buckie Thistle. United's best effort in the first half came in the opening minute when McMullan hit a low shot with the right foot after cutting in from the left to test Lennox, who fumbled but held the ball at the second attempt. Raith should have gone ahead when Mehmet mishit a clearance straight at Greig Spence who squared to Liam Buchanan, but his 20-yard effort towards an open goal was headed off the line by Mark Durnan. Keatings' shot after the restart brought a save from Lennox and the tempo of the game went up a notch, then a touch of class from McMullan from the left of the box saw him pick out the top corner for United's opener. Keatings made it 2-0 from the spot when Ian Davidson bundled on-loan midfielder Sam Stanton off the ball to concede a penalty. Billy King fired a low shot which Raith keeper Lennox saved at full stretch, then Buchanan missed a chance to pull one back for Raith from 14 yards. At Central Park, Craig Dorrat gave Buckie Thistle the lead but David Syme scored the first of two goals to equalise. Cameron Muirhead rounded the goalkeeper to put the home side ahead, and though Drew Copeland levelled Syme's second restored the lead. Ryan Connelly's fantastic solo goal rounded off the win for Billy Brown's side. Match ends, Dundee United 2, Raith Rovers 0. Second Half ends, Dundee United 2, Raith Rovers 0. Corner, Raith Rovers. Conceded by Mark Durnan. Scott Robertson (Raith Rovers) wins a free kick in the defensive half. Foul by Samuel Stanton (Dundee United). Substitution, Dundee United. Archie Thomas replaces James Keatings. Attempt missed. Liam Buchanan (Raith Rovers) header from the left side of the box is close, but misses to the left. Corner, Raith Rovers. Conceded by Paul McMullan. Corner, Raith Rovers. Conceded by Deniz Dogan Mehmet. Attempt saved. Liam Buchanan (Raith Rovers) right footed shot from the centre of the box is saved in the bottom right corner. Foul by Patrick Nkoyi (Dundee United). Corner, Dundee United. Conceded by Aaron Lennox. Attempt saved. Billy King (Dundee United) right footed shot from long range on the right is saved in the bottom right corner. Attempt blocked. Patrick Nkoyi (Dundee United) right footed shot from the right side of the box is blocked. Corner, Dundee United. Conceded by Kyle Benedictus. Ross Matthews (Raith Rovers) is shown the yellow card for a bad foul. Paul McMullan (Dundee United) wins a free kick in the attacking half. Attempt saved. Paul McMullan (Dundee United) right footed shot from outside the box is saved in the bottom left corner. Attempt blocked. James Keatings (Dundee United) right footed shot from a difficult angle on the left is blocked. Substitution, Raith Rovers. Yaw Osei replaces Greig Spence. Substitution, Raith Rovers. Ross Matthews replaces Bobby Barr. Substitution, Dundee United. Patrick Nkoyi replaces Scott Fraser. Goal! Dundee United 2, Raith Rovers 0. James Keatings (Dundee United) converts the penalty with a left footed shot to the bottom left corner. Penalty Dundee United. Samuel Stanton draws a foul in the penalty area. Penalty conceded by Iain Davidson (Raith Rovers) after a foul in the penalty area. Substitution, Dundee United. Samuel Stanton replaces Scott Allardice. Corner, Dundee United. Conceded by Iain Davidson. Corner, Raith Rovers. Conceded by Jordie Briels. Attempt saved. Lewis Vaughan (Raith Rovers) header from the centre of the box is saved in the top left corner. Foul by Mark Durnan (Dundee United). Lewis Vaughan (Raith Rovers) wins a free kick in the defensive half. Jordie Briels (Dundee United) wins a free kick in the defensive half. Foul by Euan Murray (Raith Rovers). Goal! Dundee United 1, Raith Rovers 0. Paul McMullan (Dundee United) right footed shot from outside the box to the top right corner. Assisted by Scott Allardice. Corner, Raith Rovers. Conceded by William Edjenguele.